[PDF] Earthquakes and Acoustic Emission: Selected Papers from the 11th International Conference on Fracture, Turin, Italy, March 20-25, 2005 (Balkema: ... in Engineering, Water and Earth Sciences) | Free eBooks Download - EBOOKEE! Description: Earthquakes are caused by the sudden release of energy during the fracture of stressed rock within the Earths crust. This phenomenon is similar to that which occurs in materials under load, and although they take place on very different scales, these two phenomena - earthquakes in geophysics and damage in structural materials - have similarities. In both cases, there is a release of elastic energy from sources located inside a medium. These are selected papers from special sessions at the 11th International Conference on Fracture, held in Turin in 2005. They provide an outline of topics related to earthquakes and Acoustic Emission, and discuss the latest developments in this area. The papers have been divided into two categories: Seismic Mechanics & Earthquakes and Structural Failure & Acoustic Emission. 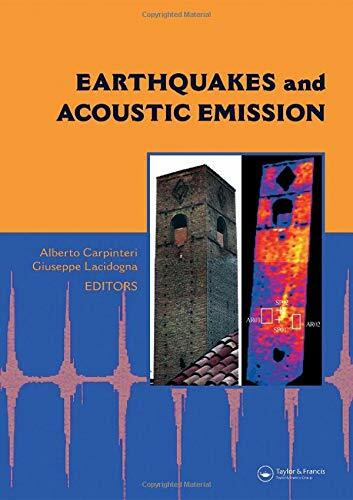 Earthquakes and Acoustic Emission will serve as a useful supplementary textbook for postgraduates, while being of special interest to professionals in the field of earthquakes and acoustic emission. No comments for "[PDF] Earthquakes and Acoustic Emission: Selected Papers from the 11th International Conference on Fracture, Turin, Italy, March 20-25, 2005 (Balkema: ... in Engineering, Water and Earth Sciences)".